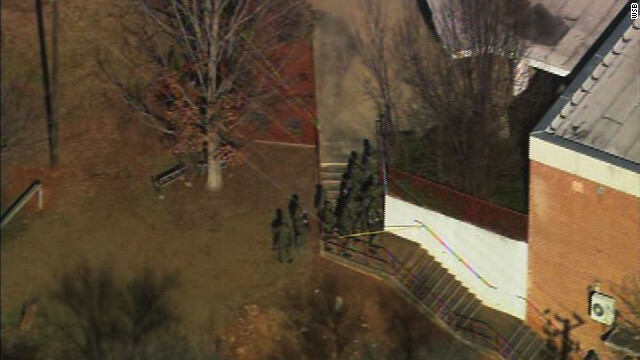 A police tactical team takes up a position at Price Middle School in Atlanta, where a student was shot Thursday. [Update 4:54 p.m. ET] Families are having joyful reunions as students pour out of four buses that have delivered them from Price Middle School in Atlanta, where a student was shot and wounded Thursday afternoon. [Update 4:45 p.m. ET] Students are being loaded onto buses for transport home or to a nearby church where parents have assembled to wait for their children. Police detectives are interviewing the victim in the hospital, his mother told CNN affiliate WSB-TV. He knows the assailant, who the mother said was "talking smack" to her son before pulling out a gun and firing, the station said. [Update 4:20 p.m. ET] Atlanta Public Schools confirmed both the victim and the suspect are students at Price Middle School. "Gun violence in and around our schools is simply unconscionable and must end. Too many young people are being harmed, and too many families are suffering from unimaginable and unnecessary grief. I pray that the student who was shot today at Price Middle School in southwest Atlanta recovers quickly and can return home to family and friends. A suspect has been taken into custody. I would also like the students, faculty and families of the Price Middle School community to know that they have the full support of the City of Atlanta as they heal from today's terrible incident. The city's Employee Assistance Program counselors are already at the school providing guidance for students, faculty and family members." [Update 4:07 p.m. ET] The mother of the student wounded Thursday at Price Middle School in Atlanta told CNN affiliate WSB that her son was struck in the head by a bullet which exited. She confirmed the 14-year-old was conscious and alert. A large crowd of parents has gathered near the school waiting for the lockdown to end and students to be released, WSB reported. Atlanta Public Schools scheduled a news conference for 4 p.m.
[Original post] A student was shot Thursday afternoon at a middle school in Atlanta, Georgia, police say. Police found a wounded student outside Price Middle School after responding to a shooting call shortly before 2 p.m., police said. "The student has been transported alert, conscious and breathing to Grady hospital," police said. The 14-year-old male victim was shot in the head, CNN affiliate WSB-TV reported. A suspect, believed to be another student, was taken into custody. The school was locked down but all other students are safe, police said. Were you there? Tell your story or send images to iReport. GUN FREE ZONE.. how does that work yout for those who post a sign? Do you really think for one second that a person with ill intent gives a crap about a sign? Do you think for one second that the sign may be an invitation to go there? the problem is main stream media seeking the story and giving these hoodlums 10 minutes of fame on tv etc. stop doing this and there will be less incidents. You are an idiot. Did you even read the story? The student shot another student because they were "talking smack" to each other. The boy didnt do it for fame...... The only way this could have been prevented is if we banned guns. Then the 14 year old wouldnt have been able to get his hands on it. god this country is screwed. We have so many dumb people like Chip here. I agree.. parents need to held responsible if the gun belonged to them and was in the home.. I do not expect a safe environment anywhere, with or without guns, for teenagers whose parents express themselves with phrases like "talking smack." If the student who shot the other student had not had access to a gun, he could have attacked with a knife or a big iron skillet. The problem is the aggressive mentality, more than it is the gun. With that spelling, no one is going to take you seriously. Here we go again! It is NOT guns, it is crazy people who are proliferating in this society. It is crazy people getting their hands on guns. This is nothing new in Atlanta Public Schools. This incident made the news. The big heads at APS Could Not Hide This Incident. The children are out of control in the classrooms and on the buses. Shame on you APS. Praying for the student and his family. Open Record Act Somebody to view all incidents in APS schools. APS Stop hiding Things! No one should be allowed to give or have easily available a gun for someone who has not had a background check including mental stability. And that includes family members, because every whacko has a family. Get the whole story at The Blaze. I've said it before and I'll say it again. The parents, if the schmuck has any, are primarily responsible. They had a choice to keep him out of the re-education centers. Get well.